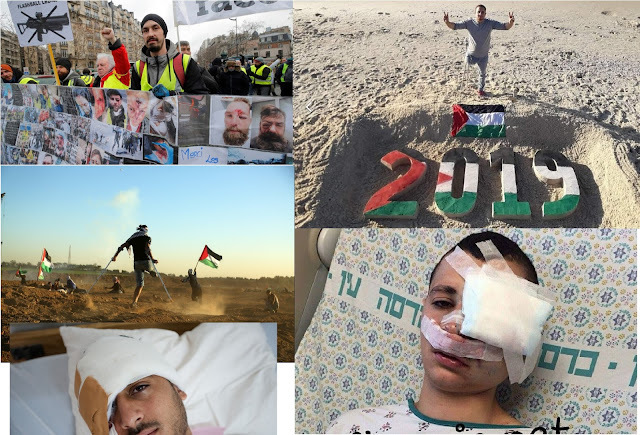 Home / France / Israel / Jews / Nazis / Palestine / Zionism / France’s Macron target French people's eyes, In Palestine Israelis target Palestinians eyes and legs, Coincidence? France’s Macron target French people's eyes, In Palestine Israelis target Palestinians eyes and legs, Coincidence? Another story happened in 2015 for an Eighteen-year-old Palestinian Mohamed Barqan where he lost his eye after he was shot by an Israeli soldier with a rubber bullet in the Jerusalem neighbourhood of Silwan, Safa news agency reported. Mohamed’s father said that his son underwent surgery on his eye while he was handcuffed to the hospital bed. He also said that doctors used metal plates to reconstruct his face which was crushed by Israeli forces after he was wounded.